Tamil Nadu Deputy Chief Minister O Panneerselvam, who holds the Finance portfolio, said that Jayalalithaa was an "embodiment" of greatness as mentioned in "Tirukkural". 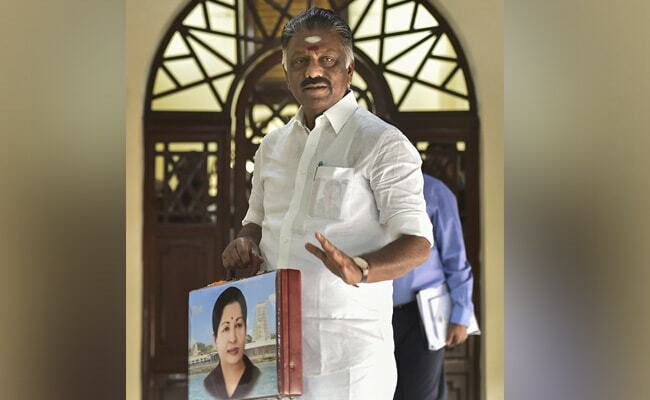 O Panneerselvam was carrying his Budget papers in a suitcase with a picture of Jayalalithaa pasted on it. Late AIADMK leader J Jayalalithaa's name was generously invoked during the presentation of Tamil Nadu budget Friday by Deputy Chief Minister O Panneerselvam, saying she continues to be the "guiding beacon and a guardian" of the state government. He also took her name before presenting the budget estimates for FY 2019-20. Mr Panneerselvam, who holds the Finance portfolio, said that Jayalalithaa was an "embodiment" of greatness as mentioned in "Tirukkural". Citing from a couplet from "Tirukkural", penned by saint poet Thiruvalluvar, Mr Panneerselvam said, "only great persons endowed with noble qualities can achieve the zenith of perfection in the performance of great deeds." Jayalalithaa was an "embodiment of this couplet, who lived by her credo of 'I am by the people and for the people', committing herself fully to the welfare of people and development of the state," he said. He further went on to say the late chief minister was living in the hearts of people of Tamil Nadu "forever" and that she was a catalyst of "our inner consciousness." "... an inspirational force to realise our potential, the late chief minister Puratchi Thalaivi J Jayalalithaa continues to be our guiding beacon and a guardian of the good governance regime established by her perseverance," he said. The incumbent Chief Minister, EK Palaniswami, was effectively following the path laid down by her, while "surmounting all challenges posed by adversaries," he said. Mr Panneerselvam said he was presenting the budget after "revering her visionary and able leadership and seeking her blessings to continue to fulfil her great legacy." Earlier, the ruling AIADMK legislators accorded a grand welcome to Mr Palaniswami and Mr Panneerselvam by thumping their desks when they jointly entered the Assembly Hall prior to the budget. Mr Panneerselvam was carrying his Budget papers in a suitcase with a picture of Jayalalithaa pasted on it. After leading her party to an unprecedented second term in the 2016 Assembly polls, Jayalalithaa died in December that year, after 75 days of hospitalisation.